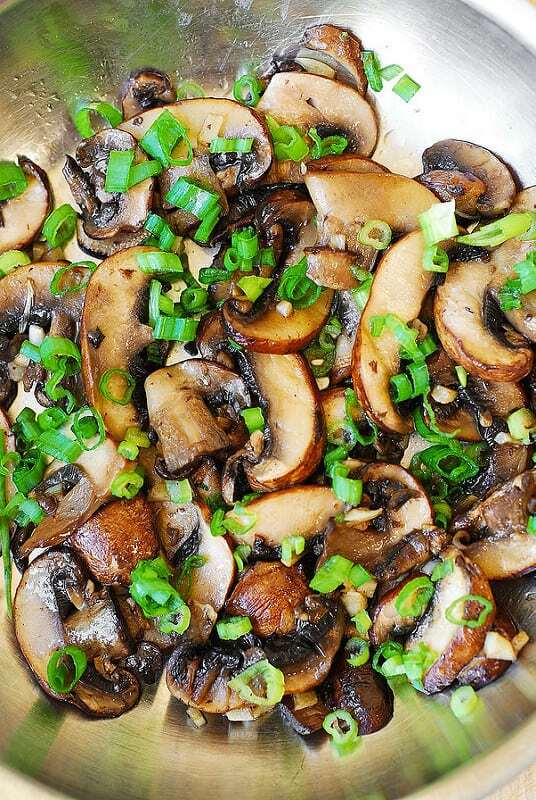 Mushrooms sautéed in olive oil and minced garlic, topped with chopped green onions. Simple, delicious, meatless, low-carb, paleo, gluten free recipe. Perfect side dish for grilled meats. The recipe uses 12 oz of button mushrooms and produces modest 4 servings that will go great with any grilled meat, especially steak! Or, you can eat it as-is as a vegetarian dish! After you have sauteed the mushrooms with garlic in olive oil, they become very juicy, delicious, with a meaty flavor and texture. Mushrooms often are at their best when prepared in the most basic way like this simple mushroom and garlic saute. This recipe is also great for paleo and gluten free life style, with just a few simple and natural ingredients producing very flavorful and filling meal! 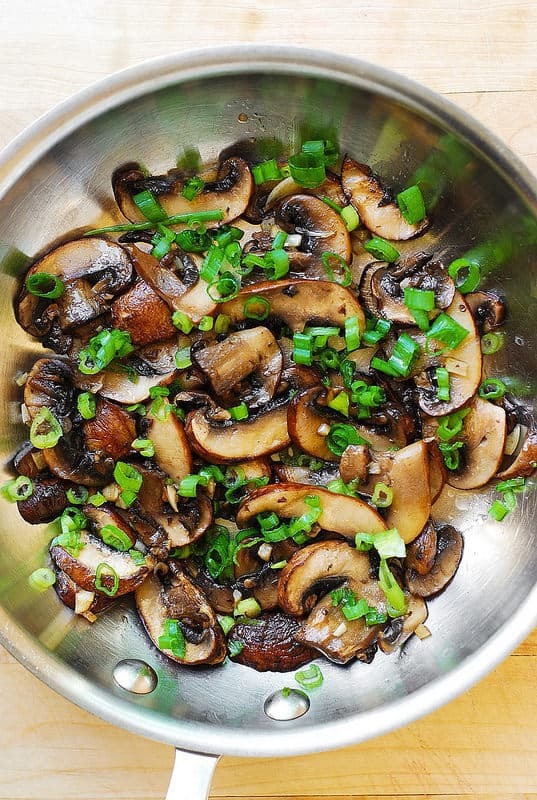 This mushroom saute is also a great side dish for KETO friendly diet, because mushrooms are low in carbs and a KETO friendly ingredient. And, of course, olive oil is KETO friendly, as well. First, thinly slice button mushrooms (12 oz). 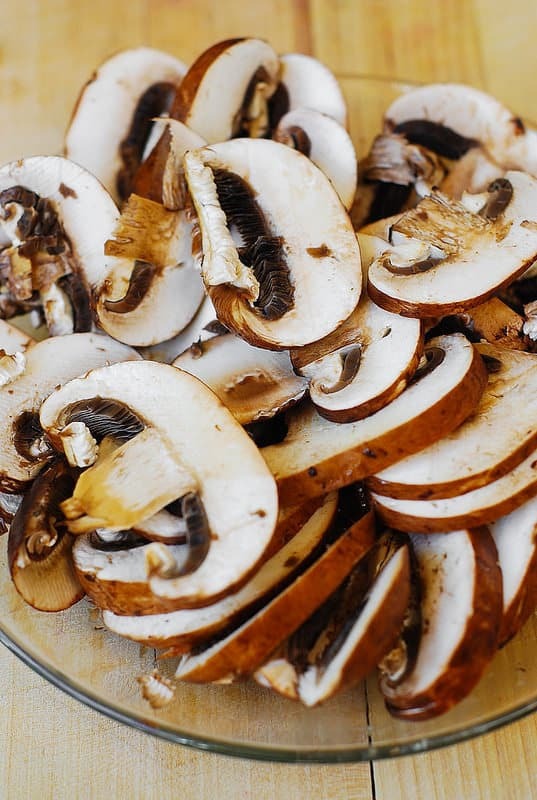 You can also use cremini mushrooms, shiitake, or thinly sliced portobellos. Heat 2 tablespoons of olive oil in a large skillet on medium heat. Add sliced mushrooms and minced garlic, and saute for about 3 minutes, regularly stirring with spatula. Sprinkle the mushrooms with a little bit of salt, cover with the lid and continue cooking the mushrooms for another 2 minutes, occasionally stirring. Having the lid on will allow mushrooms release some moisture and not get burned. Remove the lid after the mushrooms have released their moisture and saute for about 5 minutes, uncovered, on medium-high heat, stirring with spatula. Total cooking time from the beginning to end should be under 15 minutes. Mushrooms sautéed in olive oil and minced garlic, topped with copped green onions. Simple, delicious, meatless, low carb, paleo, gluten free recipe. Perfect side dish for grilled meats. KETO friendly side dish recipe. Heat olive oil in a large skillet on medium heat until hot but not smoking. Add sliced mushrooms and garlic, and saute for about 3 minutes, regularly stirring with spatula. Sprinkle the mushrooms with a little bit of salt, cover with the lid and continue cooking the mushrooms for another 2 minutes, occasionally stirring. 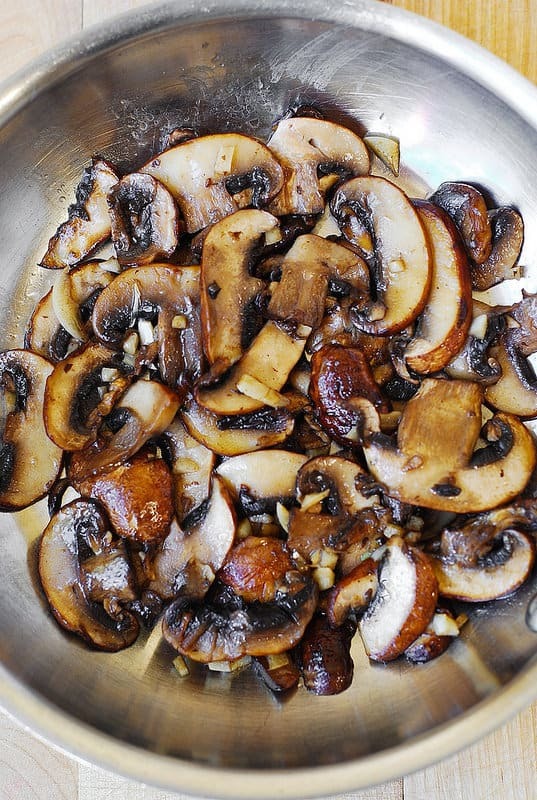 Having the lid on will allow mushrooms generate some moisture and not get burned. Remove the lid after mushrooms have released their moisture and saute for another 5 or so minutes on medium-high heat, stirring with spatula. Season with salt and pepper, to taste. Sprinkle with chopped chives or green onions. I added a half cup of sour cream and a half cup of bone broth and served part over rice, part over pasta. Delicious either way! The basic is the best!!! It makes life uncomplicated and taste buds happy. This can be eaten as a side or combined in many dishes. 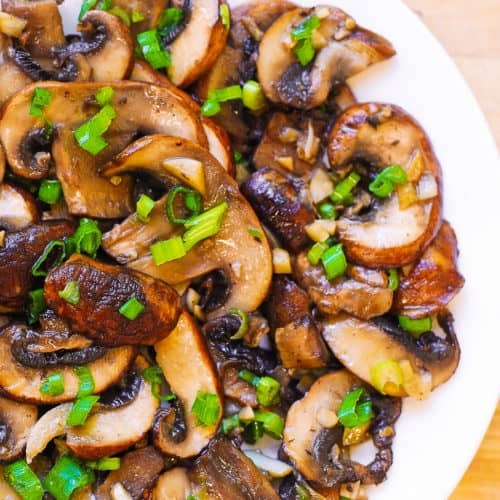 Mushrooms, garlic and scallions are the perfect combination. They taste delicious together and, when they are cooking, they smell fantastic. Love this dish. Thanks! What a great dish, love mushrooms! Oh YUMMM!! I loooove cooked mushrooms and garlic. This is totally up my alley!